Here you should find all the information you need about the history of our Church building, our Church services and other activities. We look forward to meeting you personally at St Peter's in the future. By the time of the French Revolution, church attendance had lapsed and the tavern seems to have stayed open most of the Sabbath. Working people in Sark were looking to the Methodists for moral leadership and in 1796 a Methodist Chapel was built at La Ville Roussel. 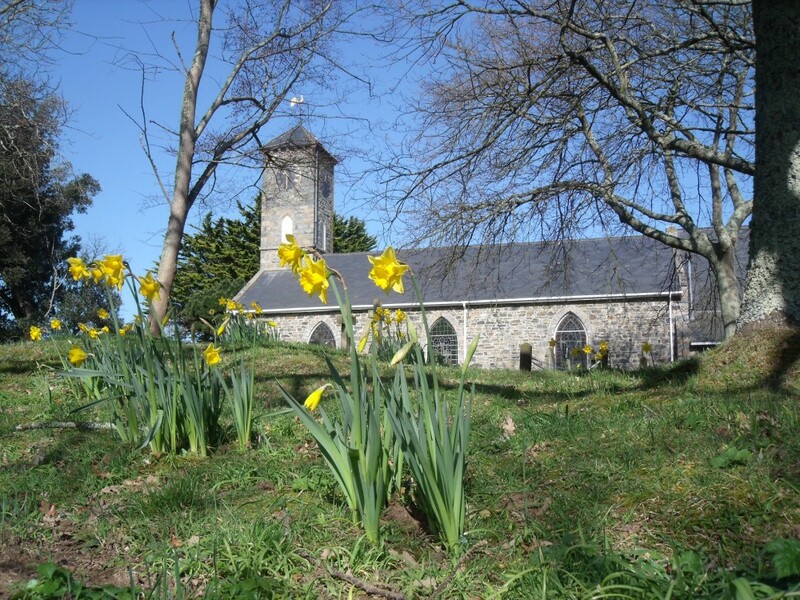 The plan of a Sark Parish Church was conceived as a means of re-establishing the authority of Anglicanism in Sark. By midsummer 1821 a plain rectangular building was complete – this is the present nave, measuring 68ft by 35ft, and 20ft high at the eaves. The east wall, which was demolished in 1877 to build the chancel, had two arched windows and a ‘round’ above, matching the west end. Originally the square bell tower was quite small. Foundations for the new church were dug by Sark workmen and the walls were built 2ft 6ins thick. Cartloads of schistic and slate stone were hauled up from Port du Moulin and granite was quarried from L’Eperquerie. Outside, the dark granite quoins that mark each 12-inch course of stonework, were brought from a quarry at L’Ancresse in Guernsey. The floor is of Purbeck flagstones shipped from Swanage. Carpentry work – framing the fir roof beams and rafters, fixing laths to bear glazed roof tiles and to support the ceiling of hair and lime plaster – was planned by Jean Tardif of Jersey and carried out by Guernsey carpenters. On 7th August 1821 the Bishop of Winchester licensed ‘the new erected chapel’ according to the rites and ceremonies of the Church of England, but it wasn’t until 1829 that he finally crossed the sea to consecrate ‘Saint Peter’s’. Both Le Pelley Seigneurs who were its patrons and worked so hard to bring it into existence were named Peter. Inside the original church, the east end was dominated by the three-tiered pulpit. This was octagonal and centrally placed between the two arched windows. It stood on a platform six feet above the pavement and was reached by a staircase rising from the minister’s pew in the southeast corner (where the organ now is). Below the pulpit, three feet above the pavement were square stalls with desks for the clerk (‘Greffe’) and the reader (‘Lecteur’) who made public proclamations. To the left, on a six-inch wooden stage, a plain communion table was enclosed by a wooden rail 6ft 6ins by 5ft. Much of the Victorian look of the church is due to Seigneur William T Collings, whose mother bought the Fief of Sark in 1852. He was a clergyman with a keen interest in contemporary Gothic architecture. In 1877, Collings designed and paid £200 for extending the east end, to form a chancel with choir, sanctuary and altar steps, and to provide a vestry. The style and building materials are eclectic; quoins, arch stones and sills are in the ‘grey and red’ Guernsey granite, so that they match the extensions which Collings had earlier made at Le Seigneurie. Inside the chancel, notice the decorative pebble panels, the use of Guernsey brick for ‘romanesque’ window arches, the stained glass and the glazed medieval-style floor tiles. The oval ‘brooch stone’ between two arches in the wall south of the altar is said to have been placed there by Seigneur W.T. Collings in memory of his daughter Wilhelmine, who died aged 8. The original high-backed public benches were replaced and new stalls were added for a choir. A harmonium was brought in beside the minister’s pew. The cost of building the church came to about £1,000. The plot was given by Seigneur Peter le Pelley from his manor lands. Part of the cost was borne by the Society for Promoting the Enlargement and Building of Churches and Chapels. Part came from the forty tenants who subscribed for closed family pews, to be attached for ever to their tenements. Pew rents secured nearly £300 before building started and ensured a perpetual income (now minuscule) for maintenance. The Society insisted that at least half the total of 333 seats be ‘open’ to the public. Unfortunately the Seigneur died before his plan materialised, and it was his son Peter le Pelley III who laid the foundation stone in Spring 1820. 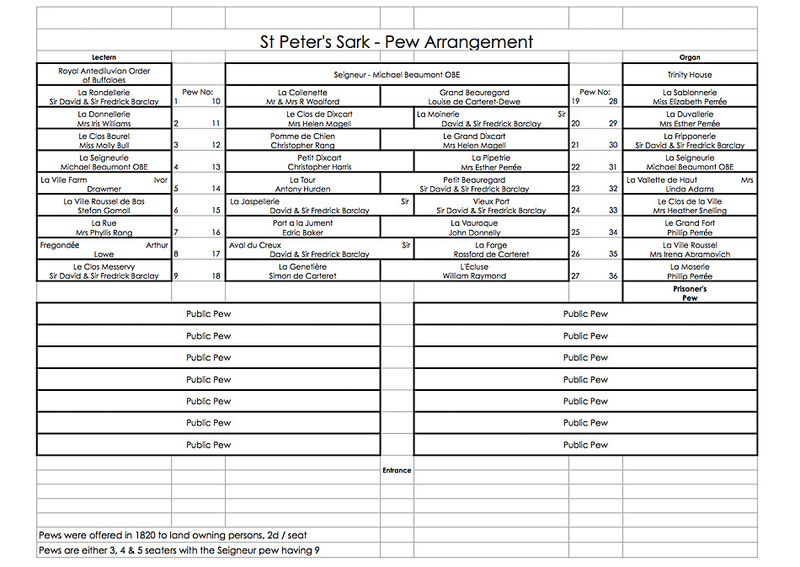 The pew arrangement for St Peters Church, Sark. The present pulpit was installed in 1883 in memory of the Reverend J.L.V. Cachemaille (minister 1835-77) and the brass eagle lectern in 1896 for his successor Charles Vermeil. Stained glass windows in the nave were made in London by Moore & Son in 1926, gift of various benefactors. Most celebrated is that of St. Magloire, who is said to have brought Christianity to Sark in 565 A.D. and to have founded a monastery (at La Moinerie). In recent years, members of the congregation have contributed by building choir stalls and working tapestried cushions and kneelers. In 1977 the Wardens of St. Peters church suggested that a Ladies Committee be formed to organise the re-covering of the pew seats and kneelers in the church. With kind permission of the Seigneur and Mrs Beaumont, the cushions of the choir stalls were begun, incorporating a pattern traced from the floor tiles of the chancel. This became known as the ‘Seigneur’s Tile Pattern’ and may not be used by other churches without permission. Members of the congregation worked it in shades of russet and cream on a dark blue background. In 1978 the Ladies Committee asked the owners of the pews whether they would finance the cost of materials to re-cover their pew seats and kneelers, and the Committee volunteered to do the work. There was an immediate response and the owners were given a choice of designs, incorporating motifs from Tenement crests and coats of arms, with the name of the Tenement worked into the seats. People from all over the Island came forward to do the work, nearly a fifth of the population being involved. A weekly meeting was set up to give out wools and help beginners with the designs. Ladies made up the majority of the workers, but some men joined in, and classes were also held to teach the schoolchildren tapestry. Visitors hearing of the project also offered to take work home, returning it the following year when they visited the island again. Once the tapestries for the chancel seats and the main body of the church were completed, the public seating at the rear of the church was begun and designs were evolved using the remains of the wool. Funds were raised to purchase wool for the background and foam rubber and canvas for the cushions. During this time a new Priest in Charge was appointed, who suggested that kneelers be provided for all the pews, and 84 kneelers were worked in tapestry and sold to people who wished to commemorate a person or occasion. On the completion of this work, the Committee became the Ladies Guild of St. Peters church which, in addition to repair and maintenance of the tapestries, made articles of knitting, sewing, tapestry, embroidery, soft toys and Christmas cards for orders or sale at the Church Fete in the summer. The first tower housed the ‘island bell’. This ancient bell was given to the settlers in 1580 by Philippe de Carteret, future Seigneur. 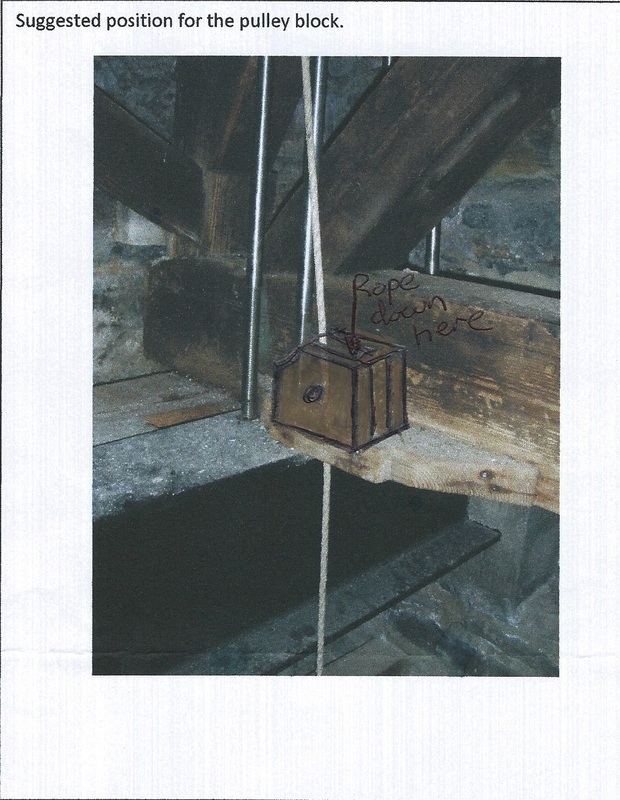 It used to hang from a wooden belfry on a mound in the Clos de la Tour de la Cloche, just to the east of the church site, and was rung to raise the alarm in cases of fire or shipwreck. By 1883 the raising of the tower was complete, again using much dark grey Guernsey granite, and the belfry strengthened. A new deep-toned bell was cast from ‘two old six-pounders’, brass cannon which had provided Sark’s defence since Elizabethan times. The old ‘island bell’ was mounted on the schoolhouse, where it still is. bell from which it is attached to the headstock). machine tuned and sounds as it was cast. Sark bell has a pleasant tone when struck. From this information I would estimate that the bell weighs about 8 ¼ cwt (420Kg). The bell bares two inscriptions one on either side of the waist. Sark. It also names the Seigneur and probably the church wardens in 1883.
by the founder against the value of metal used to cast the bell. RSJs. Stainless steel tie rods have also been added to help prevent frame movement. needed then contact me and I’m sure I can help. I hope that this information will be of interest to you and others in the parish. I think it’s quite likely that those of us who haven’t lived on Sark all our lives had probably never heard of St Magloire until we came here. And for all of us, I suspect that our knowledge is quite scanty, so I thought St Magloire’s day would be a good opportunity for us to try to get to know a little more about our Island Saint. Right from the beginning, there is doubt about his place of birth, some accounts giving it as Vannes in Brittany, and others stating he was a Welshman of South Glamorgan. However we do know that he was born in the early 500s, that his mother was a Welsh Princess, his father a Breton nobleman, and that from the age of 5 he studied at the monastery at Llantwit Major under the tutelage of St Illtud. Some sources say that he was the cousin of St Sampson and others that he was the nephew of King Arthur. After his ordination he was made Abbot of a monastery at Lammeur in Brittany and we’re told he governed there with prudence and holiness for fifty-two years. At that time his cousin, St Sampson was Bishop of Dol, and when Sampson died, Magloire was elected to replace hm. Despite his hesitation based on his sentiments of unworthiness and incapacity, he accepted, although he was already nearing his seventies. He remained there for only two or three years, and then after receiving instructions from a visiting angel, he resigned his post and in 565 withdrew to Sark where he established a community of sixty-two monks. Sark became an important centre of Christian learning as pupils were sent from Northern France to be educated on the Island, and it is believed that as many as six hundred pupils passed through the monastery during those years. It’s interesting to note that two of them were St Guénault who became the patron saint of Alderney and Tugual who settled on Herm. Several miracles are attributed to St Magloire and as a result of these, he acquired much land. He had been given the entire Island of Jersey by the Seigneur Count Lois Escon who had been gravely ill and was miraculously cured by Magloire. Then Nivo, the owner of Guernsey asked for his help in curing his daughter who was deaf and dumb, and for this Magloire was granted a third of Guernsey. He was also given half the Island of Sark by Loyesco of Brittany in return for curing his leprosy. One of the most well known stories about him concerns his rescue of a group of children who were playing on the beach below the monks water mill in an abandoned wreck, when a sudden violent storm swept them out to sea. Hearing their cries for help, Magloire is said to have transported himself out to sea and saved them and their small boat, steering it to the safety of a Breton cove before vanishing. The children were taken by local fishermen to King Judal, who, believing their story, ordered the boat to be filled with corn, flour, wool and other gifts before putting to sea again. The boat carrying the children found its way back to Sark in three days. Magloire was also reputed to be an adept slayer of dragons, and it is said that he saved Jersey from a “monstrous reptile” by his actions. The community became so self-sufficient in food that when famine hit Northern France in 586 supplies were sent from the estates in Jersey and Guernsey to feed the starving in Brittany, and many refugees including members of the Breton nobility were accepted onto Sark. We don’t know exactly when St Magloire died, dates varying from 575 – 617. However we do know that he spent his final months in his cell reciting Psalm 27 and it’s said that a visiting angel gave him the last rites, October 24th being designated as his feast day. St Magloire felt called to come to Sark and set up a community. The main buildings are believed to have been in the area where the Moinerie Hotel now stands. They built a sluice at what is now L’Ecluse and had fish ponds and a water mill, the bay below still known as Port du Moulin. The community needed to be self-sufficient, as well as coping with visitors, and at this they were so successful they were able to send supplies to the starving continent as well as caring for refugees. To do this Magloire needed to understand Sark and to appreciate all the things it could supply, fish from the sea and the ponds, cereals for flour and bread, vegetables, and good clean air.The Island provided solitude, and an inspiring place to study and became an active centre of the Christian faith. To put St Magloire’s time on Sark briefly into context, St Patrick had died in Ireland a hundred years before in 465 and throughout the 500s St David had spent his life as a missionary in Wales founding many monasteries, and dying as a very old man in 601. Columba had left Ireland in 562 to found the famous monastery on Iona just 3 years before Magloire came to Sark. Columba died in 597, the same year that Pope Gregory sent Augustine to convert the English, and it was almost another hundred years before Aidan went from Iona to Lindisfarne. So it’s true to say that St Magloire and his monastery on Sark was right at the centre of all missionary activities that were being carried out by the Celtic Saints during those years, and whilst we may not be able to claim quite the status of islands such as Iona or Lindisfarne, there are many who do see Sark as a Holy Island, and we can be very proud of our pioneering early resident, St Magloire, and of Sark’s place in the Christian world.